Many people find it challenging to pick the right patio doors for their home, especially with the variety of options available. Two factors, however, are the most important: aesthetics and function. The catch is that you might find a patio door unit that operates just fine but doesn’t match your home’s modern character. Fortunately, Renewal by Andersen® of St. Louis offers sliding patio doors that can seamlessly match your contemporary living space. Here’s how this type of door can benefit you. Many modern homes are designed with floor-to-ceiling windows, fostering a bright, airy vibe. To avoid compromising the wide-glass theme, install a sliding patio door. This type of door allows an abundant amount of daylight into your living space, which won’t only help brighten up your home, but will also boost energy efficiency. You can also customize your sliding patio door to your heart’s content. For instance, we’ll let you choose from our variety of finishes and hardware options to get the results you want. Sliding patio doors have panels that move horizontally along a track. This compact design provides a seamless transition between your indoor and outdoor space. Unlike hinged doors, sliding doors do not need extra floor space to open. This can help you save space and eliminate space constraints. One of the biggest advantages of a sliding door is it allows you to get a good outdoor view. They can also serve as an extension of your expansive windows units, framing the beautiful sunset, mountain or other natural scenes. 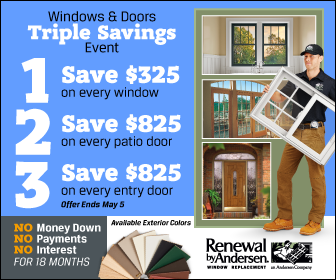 Renewal by Andersen of St. Louis installs high-quality sliding and French doors to help connect your indoor and outdoor space. Call us today at (314) 332-2364 to learn more about our products and services. We serve residents of St Louis and other nearby areas in Missouri.